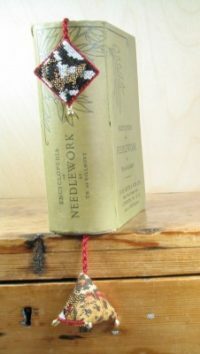 These little pyramid shaped bookmarkers have a beaded fruits, flowers, stripes and the animal one has a tiny Gecko. They are trimmed with tiny brass bells. I have tucked a penny into the flat tab that hangs out the top of your book to weight it. 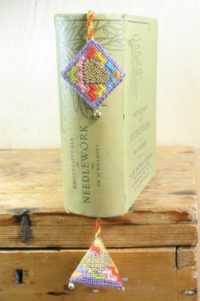 The shape is easily made from a single oblong piece stitched together in the shape of a pyramid. 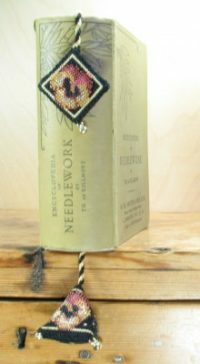 The kit contains everything you need except some polyester or wool filling to complete your bookmarker and one penny. 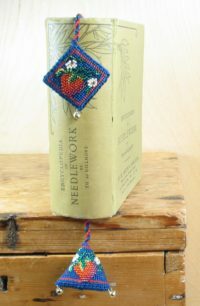 View basket “Strawberry Beaded Bookmarker” has been added to your basket.